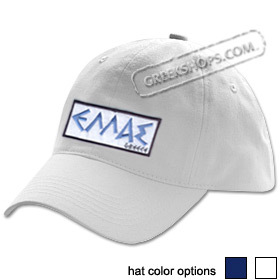 This 100% cotton baseball hat has a fashionable curved bill, and features an embroidered patch that says "Hellas" in Greek characters, and "Greece" in small English characters. Made with an Adjustable fabric closure with brass buckle and brass grommet hideaway closure. Please see more pictures for buckle detail.